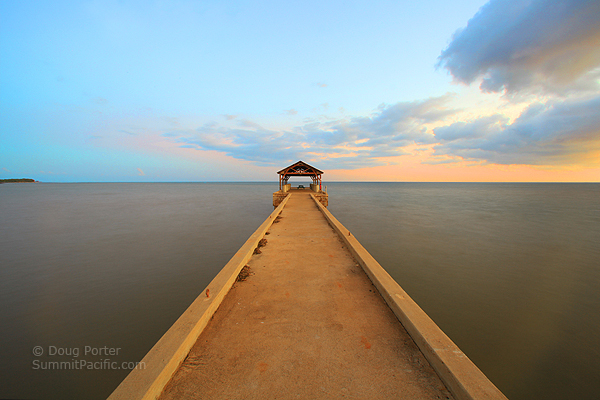 Waimea Pier and Waimea Pier State Park are located just off Pokole Road in the town of Waimea. (Turn off the main road at the Waimea Theater). Although not the original, the pier is a reminder of historic Waimea Landing which was built in 1865 and was an important port-of-call for whaling ships competing with Koloa Landing. Products exported from west Kauai were raw sugar, cattle, goats, oranges, taro, sweet potatoes, yams and rice. Inter-island steam ships visited weekly and in 1898, a railroad was constructed from Polihale to Waimea Landing serving the rice and sugar plantations along the way. Waimea Landing was important to the area until deep harbors in Port Allen and Nawiliwili were constructed in 1930. Today, Waimea Pier is used mainly for fishing and crabbing. It's also a great place to see the sunset. The adjacent park has restroom facilities and picnic tables. The beach at the pier is black sand. More information about Old Waimea Landing can be found here.